PièceL.12273 - Exterior of Jewish Old Folks Home on 13th Ave. 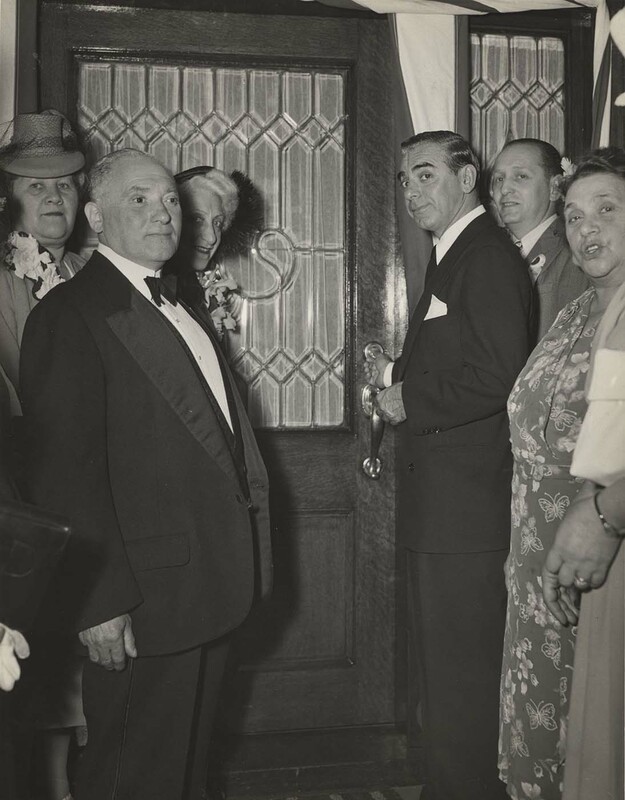 Photograph depicts (l-r) an unidentified woman, Hirch Herman, Ida Cantor, Eddie Cantor, Mr. Shine, and an unidentified woman. Written on the verso: "J. S. Finkleman. Opening of Jewish Old Folks Home on 13th. Mr. [Shine] R of Eddie Cantor. 54083-8." Caption from the JWB July 26, 1946: A shiny gold key is fitted into the lock of the Home here by the celebrated comedian, Eddie Cantor. On the left is his wife, Ida, and Hirch Herman, who paid $2,000 for the honor of presenting the key to Mr. Cantor. The money was part of $10,000 which Mr. Cantor helped gather during his two-week stay here. The photograph's title is taken from the article title. The Jewish Home for the Aged was incorporated under the auspices of the Jewish Men's Cultural Club and the Ladies' Auxiliary. The Home was located at West 13th Avenue.